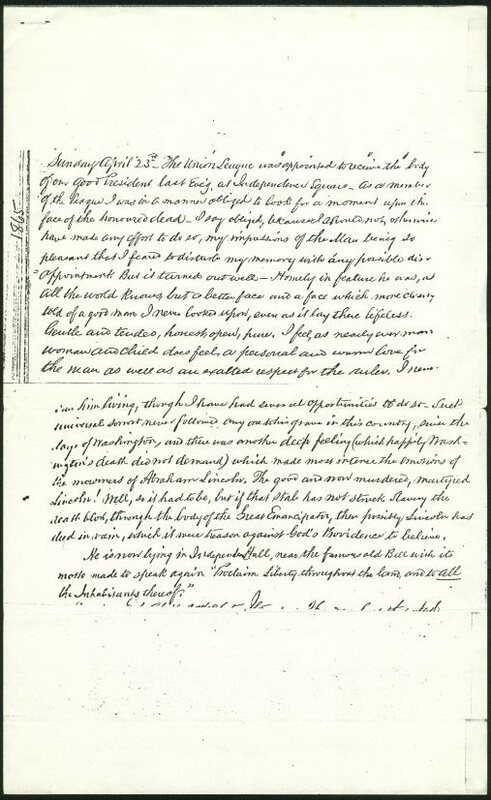 This photocopy displays two pages from the diary of Thomas Stewardson, Jr. Stewardson, a member of The Union League of Philadelphia, recorded his experience viewing President Lincoln's body while lying in state at Independence Hall. Sunday April 23rd – The Union League was appointed to receive the body of our good President last Eve’g, at Independence Square. As a member of the League I was in a manner obliged to look for a moment upon the face of the honoured dead. I say obliged, because I [should not? ], otherwise have made any effort to do so, my impressions of the Man being so pleasant that I feared to disturb my memory with any possible disappointment. But it turned out well. Homely in feature he was, as all the world knows, but a better face and a face which more clearly told of a good man. I never looked upon, even as it lay there lifeless. Gentle and tender, honest, open, pure. I feel, as nearly every man, woman, and child does feel, a personal and warm love for the man as well as an exalted respect for the ruler, [never?] saw him living, though I have had several opportunities to do so – Such universal sorrow never followed any one to his grave in this country, since the days of Washington, and there was another deep feeling (which happily Washington’s death did not demand) which made most intense the emotions of the mourners of Abraham Lincoln. The good and now murdered, martyred Lincoln! Well, so it had to be, but if that stab has not struck Slavery the death blow, through the body of the Great Emancipator, then possibly Lincoln had died in vain, which [it were?] treason against God’s Providence to believe.